Mother Courage and Her Children (German: Mutter Courage und ihre Kinder) is a play written in 1939 by the German dramatist and poet Bertolt Brecht (1898–1956), with significant contributions from Margarete Steffin. Four theatrical productions were produced in Switzerland and Germany from 1941 to 1952, the last three supervised and/or directed by Brecht, who had returned to East Germany from the United States. Several years after Brecht's death in 1959/1960, the play was adapted as a German film starring Helene Weigel, Brecht's widow and a leading actress. Mother Courage is considered by some to be the greatest play of the 20th century, and perhaps also the greatest anti-war play of all time. 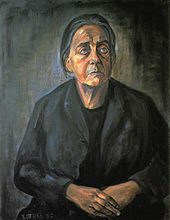 Mother Courage, with its theme of the devastating effects of a European war and the blindness of anyone hoping to profit by it, is said to have been written in a month; judging by the almost complete absence of drafts or any other evidence of preliminary studies, it must have been an exceptionally direct piece of inspiration. Following Brecht's own principles for political drama, the play is not set in modern times but during the Thirty Years' War of 1618–1648, which involved all the European states. It follows the fortunes of Anna Fierling, nicknamed Mother Courage, a wily canteen woman with the Swedish Army, who is determined to make her living from the war. Over the course of the play, she loses all three of her children, Schweizerkas, Eilif, and Kattrin, to the very war from which she tried to profit. The name of the central character, Mother Courage, is drawn from the picaresque writings of the 17th-century German writer Grimmelshausen. His central character in the early short novel, The Runagate Courage, also struggles and connives her way through the Thirty Years' War in Germany and Poland. Otherwise the story is mostly Brecht's, in collaboration with Steffin. The action of the play takes place over the course of 12 years (1624 to 1636), represented in 12 scenes. Some give a sense of Courage's career, but do not provide time for viewers to develop sentimental feelings and empathize with any of the characters. Meanwhile, Mother Courage is not depicted as a noble character. The Brechtian epic theatre distinguished itself from the ancient Greek tragedies, in which the heroes are far above the average. Neither does Brecht's ending of his play inspire any desire to imitate the main character, Mother Courage. Mother Courage is among Brecht's most famous plays. Some directors consider it to be the greatest play of the 20th century. Brecht expresses the dreadfulness of war and the idea that virtues are not rewarded in corrupt times. He used an epic structure to force the audience to focus on the issues rather than getting involved with the characters and their emotions. Epic plays are a distinct genre typical of Brecht. Some critics believe that he created the form. Mother Courage is an example of Brecht's concepts of epic theatre and Verfremdungseffekt, or "V" effect; preferably "alienation" or "estrangement effect" Verfremdungseffekt is achieved through the use of placards which reveal the events of each scene, juxtaposition, actors changing characters and costume on stage, the use of narration, simple props and scenery. For instance, a single tree would be used to convey a whole forest, and the stage is usually flooded with bright white light, whether it's a winter's night or a summer's day. Several songs, interspersed throughout the play, are used to underscore the themes of the play. They also require the audience to think about what the playwright is saying. The play is set in the 17th century in Europe during the Thirty Years' War. The Recruiting Officer and Sergeant are introduced, both complaining about the difficulty of recruiting soldiers to the war. Anna Fierling (Mother Courage) enters pulling a cart containing provisions for sale to soldiers, and introduces her children Eilif, Kattrin, and Schweizerkas ("Swiss Cheese"). The sergeant negotiates a deal with Mother Courage while Eilif is conscripted by the Recruiting Officer. Two years thereafter, Mother Courage argues with a Protestant General's cook over a capon, and Eilif is congratulated by the General for killing peasants and slaughtering their cattle. Eilif and his mother sing "The Fishwife and the Soldier". Mother Courage scolds her son for endangering himself. Three years later, Swiss Cheese works as an army paymaster. The camp prostitute, Yvette Pottier, sings "The Fraternization Song". Mother Courage uses this song to warn Kattrin against involving herself with soldiers. Before the Catholic troops arrive, the Cook and Chaplain bring a message from Eilif. Swiss Cheese hides the regiment's paybox from invading soldiers, and Mother Courage and companions change their insignia from Protestant to Catholic. Swiss Cheese is captured and tortured by the Catholics having hidden the paybox by the river. Mother Courage attempts bribery to free him, planning to pawn the wagon first and redeem it with the regiment money. When Swiss Cheese claims that he has thrown the box in the river, Mother Courage backtracks on the price, and Swiss Cheese is killed. Fearing to be shot as an accomplice, Mother Courage does not acknowledge his body, and it is discarded. Later, Mother Courage waits outside the General's tent to register a complaint and sings the "Song of Great Capitulation" to a young soldier anxious to complain of inadequate pay. The song persuades both to withdraw their complaints. When Catholic General Tilly's funeral approaches, the Chaplain tells Mother Courage that the war will still continue, and she is persuaded to pile up stocks. The Chaplain then suggests to Mother Courage that she marry him, but she rejects his proposal. Mother Courage curses the war because she finds Kattrin disfigured after being raped by a drunken soldier. Thereafter Mother Courage is again following the Protestant army. Two peasants try to sell merchandise to her when they hear news of peace with the death of the Swedish king. The Cook appears and causes an argument between Mother Courage and the Chaplain. Mother Courage is off to the market while Eilif enters, dragged in by soldiers. Eilif is executed for killing a peasant while stealing livestock, trying to repeat the same act for which he was praised as hero in wartime, but Mother Courage never hears thereof. When she finds out the war continues, the Cook and Mother Courage move on with the wagon. In the seventeenth year of the war, there is no food and no supplies. The Cook inherits an inn in Utrecht and suggests to Mother Courage that she operate it with him, but refuses to harbour Kattrin. Thereafter Mother Courage and Kattrin pull the wagon by themselves. When Mother Courage is trading in the Protestant city of Halle, Kattrin is left with a peasant family in the countryside overnight. As Catholic soldiers force the peasants to guide the army to the city for a sneak attack, Kattrin fetches a drum from the cart and beats it, waking the townspeople, but is herself shot. Early in the morning, Mother Courage sings a lullaby to her daughter's corpse, has the peasants bury it, and hitches herself to the cart. The play was originally produced at the Schauspielhaus Zürich, produced by Leopold Lindtberg in 1941. Most of the score consisted of original compositions by the Swiss composer Paul Burkhard; the rest had been arranged by him. The musicians were placed in view of the audience so that they could be seen, one of Brecht's many techniques in Epic Theatre. Therese Giehse, a well-known actress at the time, took the title role. The second production of Mother Courage took place in then East Berlin in 1949, with Brecht's (second) wife Helene Weigel, his main actress and later also director, as Mother Courage. Paul Dessau supplied a new score, composed in close collaboration with Brecht himself. This production would highly influence the formation of Brecht's company, the Berliner Ensemble, which would provide him a venue to direct many of his plays. Brecht died directing Galileo for the Ensemble. Brecht revised the play for this production in reaction to the reviews of the Zürich production, which empathized with the "heart-rending vitality of all maternal creatures". Even so, he wrote that the Berlin audience failed to see Mother Courage's crimes and participation in the war and focused on her suffering instead. In 1955, Joan Littlewood's Theatre Workshop gave the play its London première, with Littlewood performing the title role. In June 1959 the BBC broadcast a television version adapted by Eric Crozier from Eric Bentley's English translation of the play. Produced by Rudolph Cartier; it starred Flora Robson in the title role. The play remained unperformed in Britain after the 1955 Littlewood production until 1961 when the Stratford-upon-Avon Amateur Players undertook to introduce the play to the English Midlands. Directed by American Keith Fowler and presented on the floor of the Stratford Hippodrome, the play drew high acclaim. The title role was played by Elizabeth ("Libby") Cutts, with Pat Elliott as Katrin, Digby Day as Swiss Cheese, and James Orr as Eiliff. The play received its American premiere at Cleveland Play House in 1958, starring Harriet Brazier as Mother Courage. The play was directed by Benno Frank and the set was designed by Paul Rodgers. The first Broadway production of Mother Courage opened at the Martin Beck Theatre on 28 March 1963. It was directed by Jerome Robbins, starred Anne Bancroft, and featured Barbara Harris and Gene Wilder. It ran for 52 performances and was nominated for 5 Tonys. During this production Wilder first met Bancroft's then-boyfriend, Mel Brooks. In 1971 Joachim Tenschert directed a staging of Brecht's original Berliner Ensemble production for the Melbourne Theatre Company at the Princess Theatre. Gloria Dawn played Mother Courage; Wendy Hughes, John Wood and Tony Llewellyn-Jones her children; Frank Thring the Chaplain; Frederick Parslow the cook; Jennifer Hagan played Yvette; and Peter Curtin. In 1980 Wilford Leach directed a new adaptation by Ntozake Shange at The Public Theater. This version was set in the American South during Reconstruction. Gloria Foster played Mother Courage in a cast that also included Morgan Freeman, Samuel L. Jackson, Hattie Winston, Raynor Scheine, and Anna Deavere Smith. In May 1982 Internationalist Theatre gave the first UK multi-racial and multi-national performance of Mother Courage at London's Theatre Space, a basement theatre in the old Charing Cross hospital. Peter Hepple of The Stage wrote that "director Peter Stevenson has achieved a significant piece of epic theatre with his multi-national cast". Richard Ingham (Where To Go) observed that the cast "is made from experienced actors from all over the world, and perhaps their very cosmopolitanism helps to bring out new textures from a familiar dish"with Margaret Robertosn as Mother Courage, Renu Setna the Chaplain, Milos Kirek the Cook, Josephine Welcome Kattrin and Angelique Rockas Yvette. . In 1995–96, Diana Rigg was awarded an Evening Standard Theatre Award for her performance in the title role, directed by Jonathan Kent, at the National Theatre. David Hare provided the translation. From August to September 2006, Mother Courage and Her Children was produced by The Public Theater in New York City with a new translation by playwright Tony Kushner. This production included new music by composer Jeanine Tesori and was directed by George C. Wolfe. Meryl Streep played Mother Courage with a supporting cast that included Kevin Kline and Austin Pendleton. This production was free to the public and played to full houses at the Public Theater's Delacorte Theater in Central Park. It ran for four weeks. This same Tony Kushner translation was performed in a new production at London's Royal National Theatre between September and December 2009, with Fiona Shaw in the title role, directed by Deborah Warner and with new songs performed live by Duke Special. In 2013, Wesley Enoch directed a new translation by Paula Nazarski for an all-indigenous Australian cast at the Queensland Performing Arts Centre's Playhouse Theatre. After the 1941 performances in Switzerland, Brecht believed critics had misunderstood the play. While many sympathized with Courage, Brecht's goal was to show that Mother Courage was wrong for not understanding the circumstances she and her children were in. According to Hans Mayer, Brecht changed the play for the 1949 performances in East Berlin to make Courage less sympathetic to the audience. However, according to Mayer, these alterations did not significantly change the audience's sympathy for Courage. Katie Baker, in a retrospective article about Mother Courage on its 75th anniversary, notes that "[Brecht's audiences] were missing the point of his Verfremdungseffekt, that breaking of the fourth wall which was supposed to make the masses think, not feel, in order to nudge them in a revolutionary direction." She also quotes Brecht as lamenting: "The (East Berliner) audiences of 1949 did not see Mother Courage's crimes, her participation, her desire to share in the profits of the war business; they saw only her failure, her sufferings." The German feminist newspaper Courage, published from 1976 to 1984, was named after Mother Courage, whom the editors saw as a "self-directed woman ... not a starry-eyed idealist but neither is she satisfied with the status quo". The character of Penelope Pennywise in the Tony Award-winning musical Urinetown has been called "a cartoonish descendant of Brecht's Mother Courage". The rock band My Chemical Romance created the character Mother War for their third album The Black Parade. Mother War's song, "Mama", is influenced by themes from Mother Courage and Her Children, including the effect of war on personal morals. Mother Courage has been compared to the popular musical, Fiddler on the Roof. As Matthew Gurewitsch wrote in The New York Sun, "Deep down, Mother Courage has a lot in common with Tevye the Milkman in Fiddler on the Roof. Like him, she's a mother hen helpless to protect the brood." Mother Courage was the inspiration for Lynn Nottage's Pulitzer winning play Ruined, written after Nottage spent time with Congolese women in Ugandan refugee camps. 2014 – David Hare, adaptation presented by the Arena Stage, Washington DC with Kathleen Turner as Mother Courage and featuring 13 new songs. 2015 – Eamon Flack, adaptation, Belvoir St Theatre, Sydney. 2017 – Danielle Tarento direction of the Tony Kushner adaptation, Southwark Playhouse, London. 2019 - Adaptaion by Anna Jordan for the Royal Exchange theatre, Manchester UK. Starring Julie Hesmondhalgh as Mother Courage. ^ Brecht Chronik, Werner Hecht, editor. (Suhrkamp Verlag, 1998), p. 566. ^ Mutter Courage und ihre Kinder. (DEFA-Film 1959/60), after the production by Bertolt Brecht and Erich Engel at the Berliner Ensemble, with Helene Weigel, Angelika Hurwicz, Ekkehard Schall, Heinz Schubert, Ernst Busch; directed by Peter Palitzsch and Manfred Wekwerth; with music by Paul Dessau. ^ Oskar Eustis, "Program Note" for the New York Shakespeare Festival production of Mother Courage and Her Children, starring Meryl Streep, August 2006. See also Brett D. Johnson, "Review of Mother Courage and Her Children," Theatre Journal, Volume 59, Number 2, May 2007, pp. 281–282. Quote: "Although numerous theatrical artists and scholars may share artistic director Oskar Eustis's opinion that Brecht's masterpiece is the greatest play of the twentieth century, productions of Mother Courage remain a rarity in contemporary American theatre." ^ Klaus Volker. Brecht Chronicle. (Seabury Press, 1975). P. 92. ^ Hans Jakob Christoffel von Grimmelshausen. "Die Lebensbeschreibung der Erzbetrügerin und Landstörzerin Courasche". gutenberg.spiegel.de. ^ Oscar Eustis (Artistic Director of the New York Shakespeare Festival), Program Note for N.Y.S.F. production of Mother Courage and Her Children with Meryl Streep, August 2006. ^ Bertolt Brecht. Brecht on Theatre, Edited by John Willett. p. 121. ^ For information in English on the revisions to the play, see John Willet and Ralph Manheim, eds. Brecht, Collected Plays: Five (Life of Galileo, Mother Courage and Her Children), Metheuen, 1980: 271, 324–5. ^ a b "Shout it from the Rooftops", Stratford-upon-Avon Herald, April 1961. ^ , The Cleveland Memory Project at Cleveland State University "Shown here the Cleveland Play House production of Bertolt Brecht's 'Mother Courage' are (from the left) Barbara Busby as Catherine the Mute, Harriet Brazier in the title role and Kirk Willis as the preacher. Benno Frank was guest director for this American premiere and Paul Rodgers designed the set." ^ Robinson, Ian (2 July 1973). "An 'authentic' version of Mother Courage?". The National Times. Sydney: Fairfax Media. ^ Hischak, Thomas S. (2001). American Theatre: A Chronicle of Comedy and Drama, 1969-2000. Oxford University Press p.170. ISBN 978-0-1953-5255-9. ^ Christopher Hudson (6 May 1982). "Letting Mother take he load". The Standard – via Internet Archive. ^ Peter Hepple (13 May 1982). "Art of Keeping Alive". The Stage – via Internet Archive. ^ Richard Ingham (13 May 1982). "Review of Mother Courage". Where to Go – via Internet Archive. ^ "Mother Courage byBertolt Brecht". CityLimits retrieved from Rocksbackpages Library. 6 May 1982 – via archive.org. ^ Wolf, Matt (27 November 1995). "Review: 'Mother Courage and Her Children'". Variety. Retrieved 23 November 2016. ^ "Evening Standard theatre awards 1955-2002". Evening Standard. 12 November 2002. ^ a b Coe, Tony; Bessel, Richard; Willett, Amanda (1989). Brecht on stage (Television documentary). BBC Two and Open University. ^ Baker, Katie (10 September 2014). "Brecht's Mercenary Mother Courage Turns 75" – via www.thedailybeast.com. ^ Downing, John D. H. (2011). "Feminist Media, 1960–1990 (Germany)". Encyclopedia of Social Movement Media. Sage Publications. pp. 188–190. ISBN 9780761926887. ^ Hayford, Justin. "Pee Show". chicagoreader.com. ^ Gurewitsch, Matthew (August 22, 2006). "The Original 'Mother'". The New York Sun. Retrieved 25 June 2018. ^ Iqbal, Nosheen (20 April 2010). "Lynn Nottage: a bar, a brothel and Brecht". The Guardian. Retrieved 26 April 2010. ^ McGee, Celia (17 May 2018). "Lynn Nottage's 'Ruined' Adapts Brecht's 'Mother Courage and Her Children'" – via NYTimes.com. ^ Merry, Stephanie (30 January 2014). "The many moving parts of Mother Courage". The Washington Post. Retrieved 3 February 2014. University of Wisconsin Digital Collections, Brecht's Works in English: A Bibliography, online database. Doollee – The Playwrights Database of Modern Plays: "Adaptations/Translations of Plays by Bertolt Brecht"
Squiers, Anthony (2014). An Introduction to the Social and Political Philosophy of Bertolt Brecht: Revolution and Aesthetics. Amsterdam: Rodopi. 9789042038998. The International Brecht Society: "Brecht in English Translation"